Smartphone cameras have changed everything, allowing us to capture just about any moment on a whim so we can relive it forever. We say “almost” any moment because there are plenty of scenarios where using your smartphone to capture the action just isn’t a good idea. The image above shows just one example of thousands where a rugged action cam is the way to go, and now is the perfect time to get your hands on one. 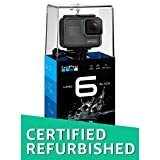 Amazon is selling certified refurbished GoPro HERO6 Black 4K Action Cameras right now for just $289, and then you’ll find an additional $15 coupon on the page. That drops the price all the way down to $274, which is an all-time low by a big margin.